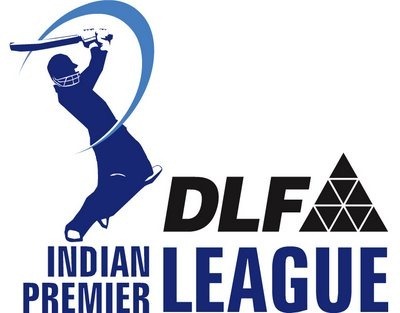 Its Semis time in IPL 3…. Two old Indian warhorse’s meet together for one more time in this season, Sachin Vs Kumble,Latter won the toss and decided to Bat infront of the home crowd in a good batting track.. But start wasn’t the best u can expect as the Man in form Sachin dismissed for 9 in the 2nd over of the match.. After few lusty shots Dhawan also gone to a poor piece of running between the wickets. Abhisek Nayar and Rayudu played the sensible innings of building the partnership, But kumble brought in a surprising bowling change, he got Pieterson to bowl, and O boy he did pick out Nayar, who is just getting in the groove, other end Jumbo sent back Duminy, which left Mumbai at 81/4 in 10 overs, Tiwary joined Rayudu to built on the very important partnership of 67 runs to rescue Mumbai from the deep trouble, this could have been well cut short if Bangalore would have been bit more alert in the field. As rayudu departed, it seemed its blessing in disguise, as Pollard announced himself with array of shots to the fences, ending himself not out at 33 from just 13 balls. Which really gave Mumbai the necessary impetus to defeat RCB.Not to leave out Tiwary who scored a brilliant half century and ran with full dedication and keeping team in the mind. MI 184/5 in 20 overs. RCB 149/9 in 20 overs. 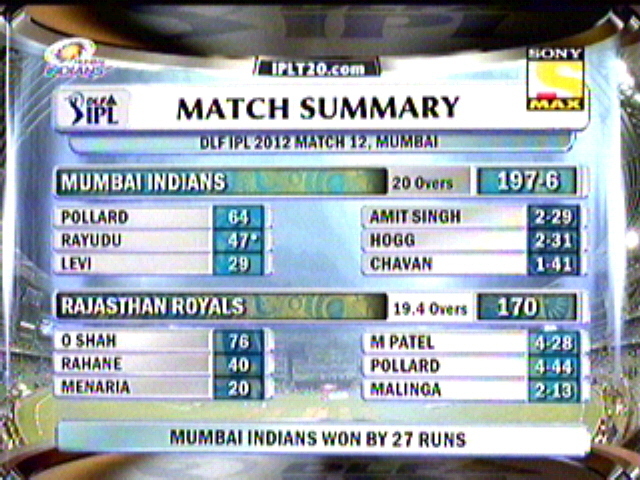 MI WON THE MATCH BY 35 RUNS. 185 runs to chase, needed a best start, RCB got Dravid to open with Kallis (really strange to see this, is someone said they are test players…?) Right from the beginning Dravid was going for shots and Kallis was playing the subdued innings, But luck ran out for Kallis as he was dismissed for 11 from 9 balls. Pieterson joined Dravid to build the innings and steady the ship until Harbhajan storm stuck again picking Pieterson with a wide Stumping,. Just in the brink of time out in 9 overs, RCB 80/2, But just after the time break RCB’s last hope dented as Two wickets (Uthappa and Dravid) gone in the consecutive deliveries, Dravid sacrificed himself for Ross Taylor. From then on No one gave the momentum for the chase and run rate never came around 14… Which meant the curtains for RCB in this season of IPL. Without doubt Kieron Pollard is the star with 3 wickets to his name. – This is the first time in this season Tendulkar is out in a Single figure. – 3rd time in this IPL 2 No-balls are bowled in a same overs, latest being Kumble. – K.Pollard played is 5oth T20 game. – For the first time in IPL Mumbai will go into finals. Orange Cap – Sachin Tendulkar (570) followed by J.Kallis (553) and S.Ganguly(493). Purple Cap – Pragyan Ojha(20) followed by Amit Mishra(17) and Harbhajan(17). Most Sixes – Robin Uthappa (27) followed by Yusuf Pathan (24). Most Fours – Sachin Tendulkar(79) followed by J.Kallis (20). And indeed all the franchises shown keen interest to get in some key players.Glitzy auction was attended by Franchises owners like, Vijay Mallya with RCB skipper Anil Kumble, Nita Ambani for Mumbai Indians, Ness Wadia and Preity zinda for KXIP, Shilpa Shetty for Rajasthan Royals. Kieron Pollard, a newly revealed tornado of Trinidad and Tobago was the hottest star of the day, where bid rose from $200,000 to $750,000 (approx. 3.42 crores) in no time. Four Franchises bided for the maximum limit…. Chennai Super Kings, RCB, KKR and Mumbai Indians tried really hard to keep hard hitting all rounder Pollard with their team, but in the end, it Ambani’s who won the undisclosed silent tie breaker bid and took Pollard to Mumbai. Another new West Indian player who rocked this year was Kemar Roach of Trinidad and Tobago(Hope u all remember his fiery spell against against Ricky Ponting) who price also went in sky in no time and finally sold out for second best price $720,000 to Deccan Chargers. Wayne Parnell, South African Pacer, who was finally won by Delhi Daredevils was sold out for $610,000. Another South african player who was sold out is Yusuf Abdulla for $50,000 to KXIP. After bidding for key players Chennai was able to get Justin Kemp for $100,000 and Thisara perara (lankan pacer) for $50,000. Left Hander Eoin Morgan found his place in RCB with the price of $220,000. Another ICL returnee Damien Martyn, was sold out to Rajasthan royals for $100,000 and another Australian who was picked by the same was Adam Voges for $50,000. Only thing which was so sad was that None of the 11 Pakistani players are even taken for Bid (in case if u have forgot, they are ICC world Twenty-20 Champions), Franchises are perplexed about the Visa problem for Pakistani players. So no one found their places in IPL season 3, which included key players like Shahid Afridi(Currently he’s the Skipper of Pakistan T20 team), Umar and Kamaran Akmal and speedster Umar Gul..
3 other Indians are picked by draft system who will be getting a sum of Rs.8,oo,000. Harshal Patel – Mumbai Indians. 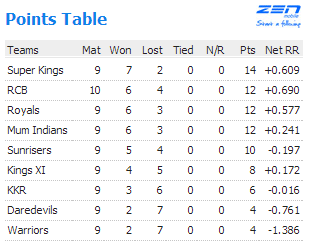 That’s it from the centre as of now, pls look over this place for new updates about IPL 3….